The Weeki Wachee Mermaids are Back at the Florida Aquarium! This Weekend Only! Hey everyone! Jerm here on a late Friday afternoon to tell you about some good stuff going on at the Florida Aqaurium this weekend! Mermaids from the Weeki Wachee Springs State Park are splashing into The Florida Aquarium&apos;s largest tank, the Coral Reef exhibit with shows at 11 a.m. and 4 p.m. in addition to the regular Coral Reef Dive Show. If you miss the show this weekend, don&apos;t worry! 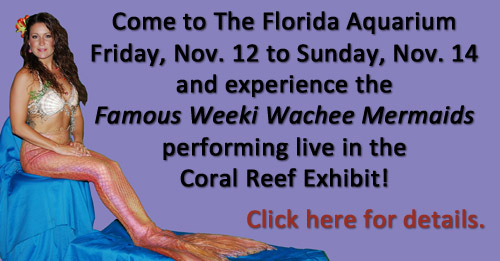 The Famous Weeki Wachee Mermaids will be appearing at The Florida Aquarium multiple times in 2011! I got there late last year and missed the performances, so please note that the Mermaid show has limited seating and will reach capacity. Complimentary show tickets are only available on a first come, first serve basis at the first floor lobby on the day of the show. For more info on these awesome Mermaids, be sure to check out the Florida Aquarium website, or the Weeke Wachee website! That&apos;s all for now, but have a great weekend and stay tuned in for more updates on what to do in Tampa Bay!